Being a blind woman in a haunted house should be terrifying. That darkness won’t go away just because you shine a flashlight on something. You are hopelessly mired in murk, only able to tell what is around you by the hot breath on the back of your neck. That is a difficult thing to convey in a visual medium like video games, though, but Perception makes an interesting use of it throughout an unsettling adventure. Perception’s players take on the role of Cassie, a blind young woman moving through a haunted house that she has been seeing in her dreams. Don’t expect to view a pitch-black world, though, as the game makes use of echolocation, using sound to paint a picture of the location Cassie’s standing in, radiating visibility out from whatever noise she makes. The developers have done their research in this department, and have created a striking world through the use of visualized sound. A tap of Cassie’s cane sends out a sound wave that paints her environments around her, a wonderful effect that will have you banging on every single surface to watch the world appear out of the darkness. Not only this, but errant sounds in the environment will also create this effect, showing you visions of distant objects as wind passes over them, or they hiss with static or steam. It’s a wonderful effect, and creates something special in a genre that so often relies on murky darkness, but does so in dull ways. Here, darkness still gives that vision-obscuring look that horror feeds on, but in a way the player can still ‘see’ through. However, Perception’s heroine is blind in more frustrating ways. 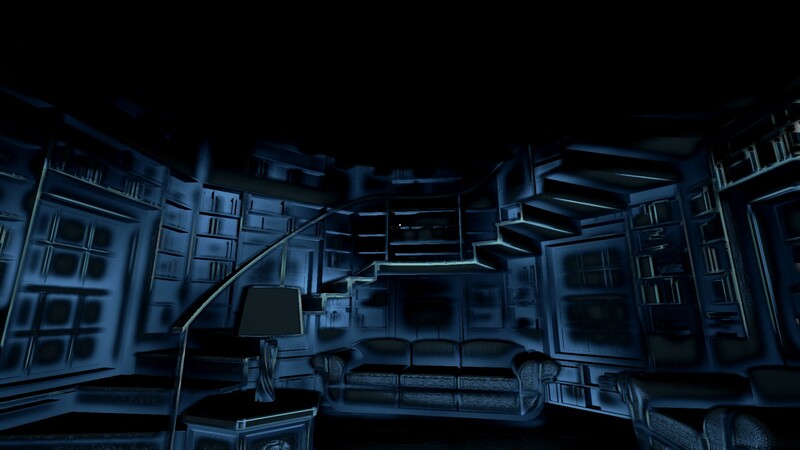 The mansion is an expansive place, giving room after room for players to go through, and your objectives tend to be scattered all over this colossal house. Due to the nature of how players can see, it can be difficult to remember landmarks or other areas since it’s mainly black halls and a few odd pieces of furniture within the murk. The developers have worked hard to make some rooms stand out, but the house never really feels like a place you get to know well. It just feels like a mish-mash of corridors and rooms that there are sometimes objectives and pieces of furniture in. This problem partially stems from how the game expects you to play through it. The objectives don’t really flow together, making Cassie’s journey feel disjointed. She may have to go find an item on the other end of the house, or go to another room far away, or unlock a filing cabinet for some reason. The story never really explains why you’re doing these things all that well, content to weave its tale without explaining why this next activity is what moves the plot along. Not all the time, but a lot. Players can get around this by holding a button to show them their next objective, but this feels like you’re just on a journey on rails. It no longer feels like you’re poking around a haunted house, but instead being lead by the nose to the next setpiece. And since you’re blind, you might miss whatever exciting thing happens in that location due to looking in the wrong direction without knowing it, as it’s easy to lose your bearings. It would seem that the button is in place just to help people who are stuck, but I was always stuck. I rarely knew where the game expected me to go next, or why, and so I had to rely on the button to keep going. I could have not used it to allow myself to be immersed in the atmosphere a little more, but that meant wandering halls for minutes on end, fiddling with things in hopes that they would trigger the next event. Playing without this button seems more in keeping with the spirit of the game, though, allowing players to take in the experience of wandering while being unable to see. The house is difficult to get down in your mind without extensive, extensive meandering, though, so for many players, this may be a sticking point that pushes them in the direction of using the button. It makes it a handy band-aid for a difficult situation, but it’s one I feel takes away from the experience the developers want to create. This may upset players looking for a more guided horror experience, but those who just want to get lost in the narrative will get more out of it. As you’re lost, you’ll find objects that relay bits of several different stories. These notes and objects are strewn all over the house, giving players a little something to find as the seek out their next objective. The first and final stories are a little too predictable and told too quickly to make them very interesting, unfortunately, but the middle two tales are far more unique, telling interesting narratives that will draw the player into the exploration a bit more. Getting lost in chapters two and three isn’t so bad, as their stories feel well worth finding bits and pieces of. You may not want to wander too long, though, as the game’s antagonist, The Presence, can really screw up your day. This creature can kill you on contact, and it shows up any time you do too much banging around in the house. Since dying often means going a good ways back, you’ll want to avoid this cloaked critter, but banging around is the only reliable way to see. It should create a tension around staying sightless and safe, or seeing and risking capture, and for the most part, it does. You hesitate to make yourself able to see at times, afraid that thing will come rushing your way in a haze of red that fills the area around you. It’s unsettling to be in the dark, knowing something is lurking nearby, and that you’ll have to make a noise that will draw its attention to escape. The trouble here is that players will miss things while blind. They’ll meander past locations or get themselves turned around. For some, that may be part of the fun of exploring a haunted house, but it easily gets frustrating when you’re trying to figure out where to go. Making players afraid to use their ability to ‘see’ is a neat idea, but this can quickly get annoying, especially in later chapters when The Presence shows up in a hurry if you tap only a few times. I feel the objective-locating button is meant to fix this, but it kills immersion, so what you end up with is a bunch of systems that all seem to run counter to each other. I want to see, but I don’t want to die, so I get lost, get frustrated, and either use the button that kills immersion, or I bang on things enough to see, get killed, and get irritated, which kills immersion. That being said, there are times when it all clicks together, and when it does, it’s very good. The final chapter, which features a much smaller area, feels tight in its design, leading the player using more contained areas so that they’ll reach their objectives more naturally without minutes of wandering. The Presence is more aggressive here, but the small level size makes dying less of an irritation, letting players embrace the fear it creates over frustration. It’s a drag that it works so well here, but since chapters two and three work well for narrative reasons, and the final chapter works well with gameplay, you still have a solid game, in various ways, despite some annoyances. 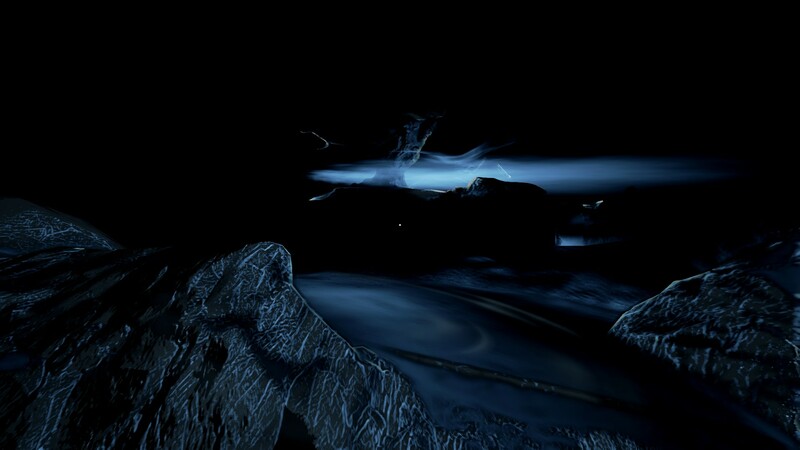 Perception seems to be at odds with itself in places, but it’s an undeniably interesting game. Using sound to ‘see’ as you wander a haunted house creates some issues, but it’s also an intriguing mechanic that makes for a unique horror experience. It feels like it leans more to being a narrative experience with some eerie elements, so horror fans may have some issues with it, but it still introduces a whole new way to make players feel afraid.